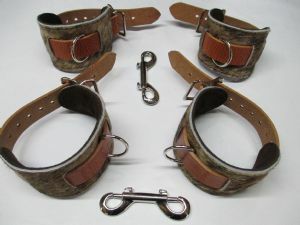 Leopard Set (Ankle and wrist x 4 Piece) restraint cuffs, in Exotic Leopard Print hair on hide leather, fur lined, with black leather, roller buckle fasten London Tan leather straps, chrome fittings. Set comes with a Large and small double ended trigger hooks. Walnut wood handled Flogger 6" length, soft Dark Brown Calf skin leather 17 x 1.5" wide Falls, total length of flogger 24", finished with a leather hanging cord. A great thuddy flogger. 4 Point London Tan Hogtie 13" width, 1" riveted straps with 4 x end quick release swivel trigger hooks. Medium Exotic Leopard Print Paddle 14" length, 3"wide with hanging cord. Medium Exotic Ostrich Print Leather Paddle 14"length, 3"wide finished with a leather hanging cord. Long handled London Tan spoon paddle, 13"long, 3"wide and 5mm thick, for those hard to reach places! A 25% discount has been applied to the original price of £210.00 as a multi-buy item/set discount saver. We Ship WORLDWIDE and only ever use discreet plain packaging, with just our zip code not our business name on the exterior of parcels as required by our shipping agent. All items are Tracked and signed for security purposes (You will need to sign for the package on delivery).